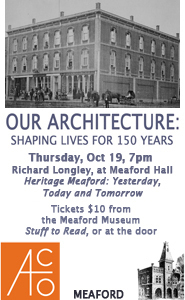 As 2012 brings both promising developments and some heartbreaking ones for heritage architecture in Meaford, it's worth taking a look at progress with Meaford's Community Improvement Plan. 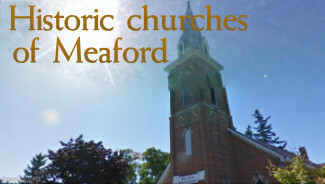 In December, Rob Armstrong, Director of Planning and Building Services for Meaford, presented a report covering a Community Improvement Plan Update and recommendation. "To date, the Municipality has utilized the voluntarily guideline method, when approached about improvements to existing buildings. There has however been some concern with the lack of control that could result in the removal of a building without a proper evaluation process in place to evaluate whether it can be preserved first. As noted in the CIP, the Heritage Conservation District would be the best tool to address this issue." What's more, although the item was originally included in the action plan for third quarter of 2013, Council has now voted to include funds to begin the study in the 2012 budget. "Council does have the authority under Section 38 of the Planning Act to identify by resolution their desire to prepare a Heritage Conservation District Plan and then pass an Interim Control By-law to freeze any development and demolitions within the study area for a period of 1 year with the potential for a maximum 1 year extension or until the study is complete, whichever is sooner. This approach, which can prevent any demolitions, can potentially hinder some development of properties that we wish to have redeveloped and are also sometime viewed as confrontational, which is not the image that this municipality is hoping to portray. It is therefore recommended that we continue with the cooperative approach that we currently have and monitor the situation. The highlighted section refutes the entire concept of a "proper evaluation process". The point of a process is to ensure all demolitions and development are subject to a considered review. Surely an interim control bylaw could prohibit demolition without hindering development where demolition isn't required. In light of recent losses which demonstrate just how easily someone can tear a fabric in Meaford's heritage, an interim control bylaw is exactly what we need. The updated report notes that "around the time the CIP was approved, the Municipality was moving away from the formal Committee structure. It is very important that the Municipality have a resource to obtain knowledgeable input into development projects and compliance with the historic architectural guidelines and also evaluate proposals under a Heritage Conservation District. In this regard, another option that Council could consider is retaining the services of a Heritage Planner or architect to do the evaluation and make recommendations to Council. For development project the costs of this can be recovered like other Peer Review consultants� If Council still wants to consider a Committee structure as an advisor to Council, a terms of reference would need to be developed for the Committee that clearly defines their role." A Municipal Heritage Committee is an established and proven resource which brings a variety of expertise to the table, (not just a single "consultant's" opinion). It's free. It exists continually and locally, so there's no need to make a decision to call upon an outside consultant in a specific circumstance, and council can call on the committee for fast answers. It allows for evaluation of properties beyond a Heritage Conservation District. And lest people fear a draconian, powerful beast, its role is simply to consult and assist council on matters relating to heritage properties.